Steam is the ideal software to enjoy your games and socialise with your friends. With a thriving community and tons of mods for all your favourite games, it's a great all-round game management app. 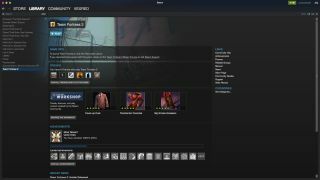 Steam is a standalone client that lets you download and play games, chat with your friends and store your save progress in the cloud. Around 70% of all PC games bought online are downloaded through Steam, and with more than 3,700 games available for download and over 100 million active users, to call it popular would be something of an understatement. But it wouldn't do it justice to leave it to that. There's a store packed with superb games from big name publishers, as well as plugins and mods from a whole range of independent creators and fans in the Steam Workshop. There's also a lively community, and you can chat with your friends while you game, useful for coordinating raids or planning your team's next move. You can add games from rival clients to your library (such as EA's Origin client), use Steam to update your graphics drivers, install games remotely and even stream games to other computers and Windows tablets on your network. Steam is more than just a conduit through which you can play games; it aims to be the complete gaming hub for you and your friends, and it does that very well indeed.